Support lawmakers who support homecare and hospice! Contribute to individuals running for the Pennsylvania House or Senate. 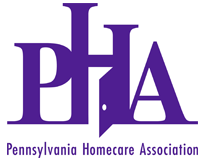 Just designate the amount you want to contribute and you'll play an important role in PHA's advocacy efforts to support state officials who know and support the homecare and hospice industry. Reminder to LLCs! LLCs (Limited Liability Companies) can now contribute to HomePAC, as well. Partnerships, limited partnerships and LLCs may not contribute as entities, BUT a contribution may be drawn on the account of a partnership or LLC and is treated as a personal contribution as long as the account does not contain the funds of any corporate partner or member. Click here to download a HomePAC brochure with details. Click here for a list of 2019 HomePAC contributors. Click here for a list of 2018 contributors. Contributors at all levels will receive a HomePAC pin with a designated ribbon based on the contribution level, as well as recognition on the PHA website.